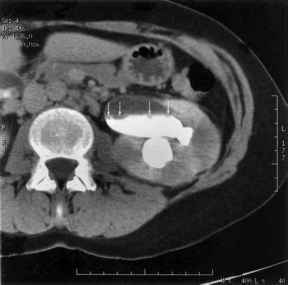 Several problems can be encountered when performing and interpreting CT urograms. Knowledge of these potential pitfalls is important so that studies can be performed with the optimal technique and erroneous interpretations minimized. Figure 13 Tiny bladder cancer. A 3 mm diameter bladder cancer projects into the contrast-containing lumen of the urinary bladder (arrow), producing a small filling defect. This could not be seen on any of the 3-D reconstructed images. A variety of criteria must be satisfied for CTU to be of excellent quality. Patients must be able to cooperate. Specifically, they must be able to hold still and to hold their breath briefly. As newer generation multidetector scanners have appeared, scan times have continued to diminish, such that with the newest 64-row scanners, thin-section images can be obtained through the entire abdomen and pelvis in only about 10 seconds. This has eliminated the need for prolonged breath-hold scanning. Patients should also not be exceedingly obese and should not have a large amount of metallic material located adjacent to any portion of the urinary tract, because these situations can result in the production of extensive artifacts. A number of other high attenuation structures can also interfere with the interpretation of 3-D reconstructions. Overlying calcification (such as gallstones) can be mistaken for renal or ureteral calculi on 3-D images. If patients are mistakenly asked to ingest oral contrast material (which should not be administered to patients undergoing CTU), it may also interfere with the assessment of the urinary tract on subsequently created 3-D images. Figure 14 Bladder blot clot. (A) Large soft tissue attenuation masses fill the bladder lumen in this axial image of a patient whose bladder also contains a Foley catheter and air. The intraluminal blood clot is easily seen because it is well delineated by the surrounding low-attenuation unenhanced urine along its anterior, medial, and lateral borders and by a small amount of contrast-containing urine along its posterior border. (B) The blood clot is also identified on the excretory-phase, volume-rendered, reconstruction (arrow); however, it is much more difficult (if not impossible) to determine whether the abnormality is extrinsic, mural, or intraluminal on this image. Figure 15 Cystitis. (A) Mild circumferential bladder wall thickening (arrows) is identified in this patient, who was later diagnosed as having cystitis. When bladder wall thickening is diffuse, it is most commonly due to inflammation rather than neoplasm. 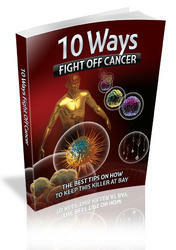 Conversely, focal bladder wall thickening is often due to cancer. (B) As with EU, the excretory-phase, coronal, volume-rendered 3-D image allows only for visualization of the bladder lumen, so that bladder wall thickening is not suspected. The bladder base is elevated due to prostatic enlargement. Abbreviation: EU, excretory urography. Figure 16 Nonopacification of a normal ureter. (A) Excretory-phase axial image shows contrast material in both ureters. No ureteral wall thickening or luminal filling defects are identified. (B) Several centimeters more caudally, the right ureter is again noted to be opacified; however, the left ureter no longer contains any contrast material, due to peristalsis. (C) Coronal, excretory-phase, volume rendered image reveals that a large portion of the left ureter was not opacified during image acquisition. The authors' solution to this problem is to read such a study as "negative," with the understanding that on rare occasions, tiny, nonobstructing ureteral lesions could be missed. frequency with which nonopacification occurs does appear to vary. In a study by Inampudi et al. (27), portions of the proximal, middle, and distal ureters were not opacified on excretory-phase CTU images obtained at 300 seconds in 5%, 19%, and 33% of patients, respectively; however, by 450 seconds, the percentage of nonopacified ureters in each of these three locations was generally lower (at least more distally), at 8%, 16%, and 24% (27). 1000 CTUs performed at our institution thus far, we are aware of only one instance in which a ureteral polyp was not prospectively identified because it was located in a nonopacified segment of a normal caliber ureter. Nonopacification can also be a problem in patients with urinary tract obstruction. When obstruction is present, excretion into the renal collecting systems and ureters may be delayed, and there may be minimal or no contrast material in the renal collecting systems, ureters, or bladder at the time of excretory-phase image acquisition. Fortunately, pelvicaliectasis and ureterectasis are usually present, and the water-attenuating urine can serve as a negative contrast agent within which urinary tract abnormalities (including the cause of obstruction) are often easily identified (Fig. 17). Figure 17 Nonopacification of an obstructed ureter. (A) Nephrographic-phase axial image reveals a markedly distended urine-containing left ureter (arrow). (B) The ureter becomes filled with soft tissue attenuation material more caudally (arrow), indicating the presence of a large mass, subsequently confirmed to be a transitional cell carcinoma. (C) The ureteral carcinoma is also well seen (arrow) on this sagittally reformatted image. Finally, partial nonopacification can occur after there has been excretion into any dilated/distended portions of the renal collecting system, ureter, or bladder, due to the nondependent layering of unopacified urine above the heavier high-attenuation urine containing the excreted contrast material. This is most commonly encountered in the bladder if the patient has not been asked to move (by turning over or by walking around) after excreted contrast material begins to enter the bladder. In a motionless patient, the excreted contrast-containing urine layers dependently, or posteriorly, in the bladder of a supine patient, whereas unopacified urine layers non-dependently, or anteriorly. Uroepithelial abnormalities, including neoplasms, are more likely to be missed if they are located in the nonopacified areas in the bladder or in dilated renal collecting systems or ureters. 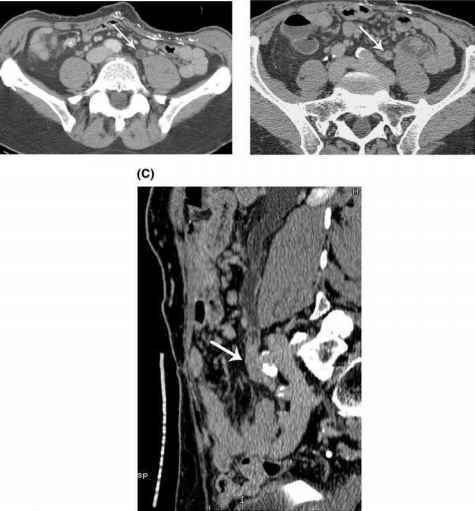 We have encountered one patient in whom a large transitional cell carcinoma in the anterior aspect of the bladder was not prospectively identified for this reason. Two findings that are of no clinical significance can occasionally present interpretive problems because they can mimic important renal collecting system or ureteral pathology. When the ureter is tortuous, areas of redundancy/kinking may lead to confusion when only axial images are reviewed. 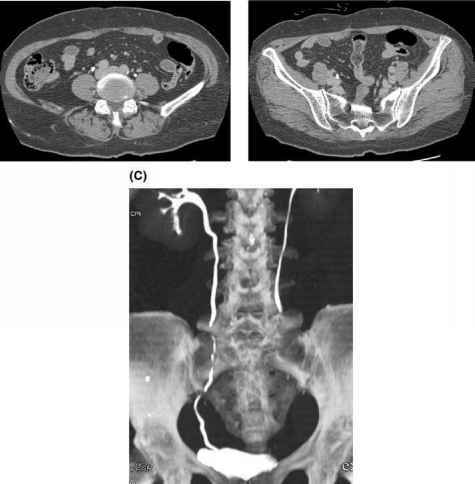 Apparent filling defects may be suggested in places where the ureter loops back upon itself, leading to false positive diagnoses of ureteral lesions, including transitional cell carcinoma. False positive diagnoses due to ureteral kinking can usually be avoided by recognizing that the ureter has a tortuous course. Postprocessing can also be helpful. The anatomy is frequently most easily understood by reviewing 3-D coronal- or sagittal-plane reformatted images (Fig. 18). Another occasionally confusing anatomic variant is due to prominent but normal renal papillae. Prominent papillae may bulge quite strikingly into the calices, producing pronounced concave impressions that can be mistaken for small uroe-pithelial neoplasms. Here, careful review of axial images usually facilitates differentiation of these normal papillae from pathology. Pronounced papillary impressions are usually multiple, similar to one another, and bilaterally symmetric (Fig. 19). What cause false positive filling defects in ureter? Can a tumor be missed on unopacified ureters on ctu? Is it normal to have opacified ureter?